. Reason being a horizontal gash across his right eye, could it be from the knife used to dig out the holes on his cheeks? Also, his horns don't look spread out enough. Fake item? In a fake ukg case? Seller of this questionable item is Scott Hughes. Anyone has ever dealt with him? 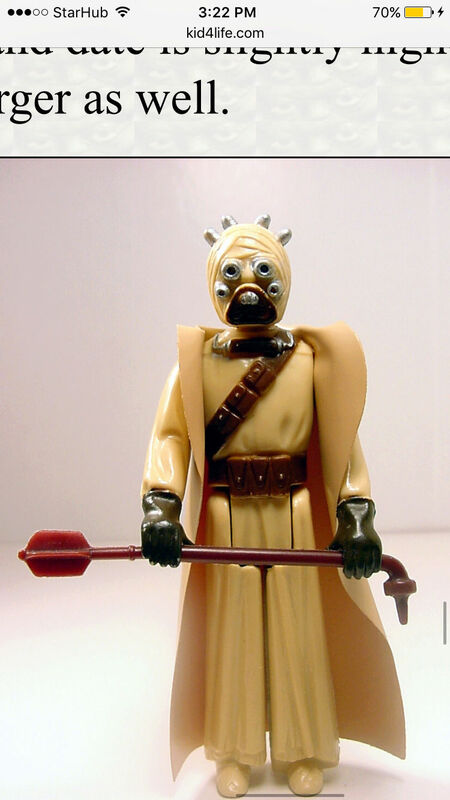 Featured in Yodanews.com also has a similar hollow tubes tusken raider with an acute angle upper sprong. 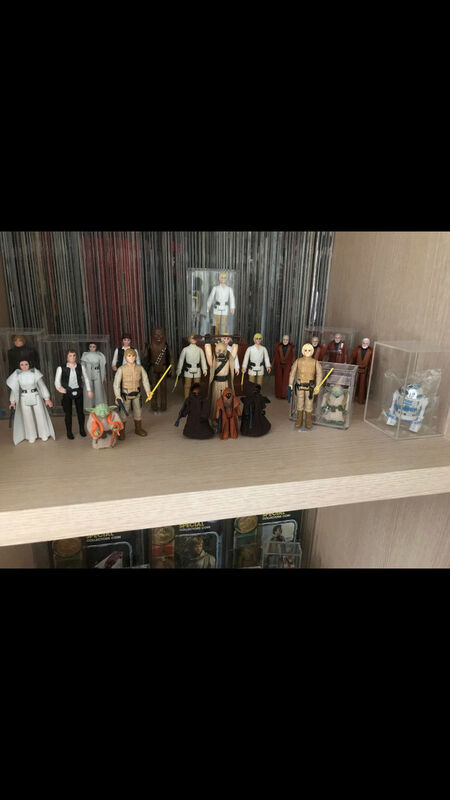 It can be seen in http://www.kid4life.com/yoda2/vtotw12.htm. Since Aussie James has confirmed that it looks wrong, I have proceeded to destroy the case as well as the figure. Ukg would prob say to send in the figure to check. 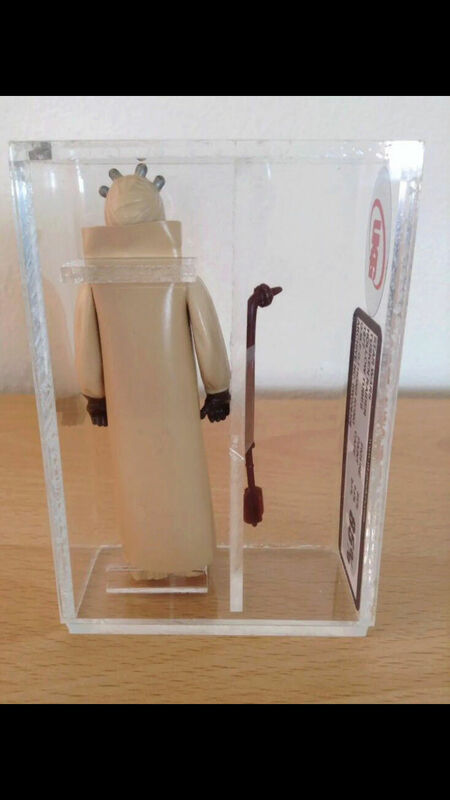 Just to confirm this figure in yodanews is the same one right? With the acute angle sprongs. 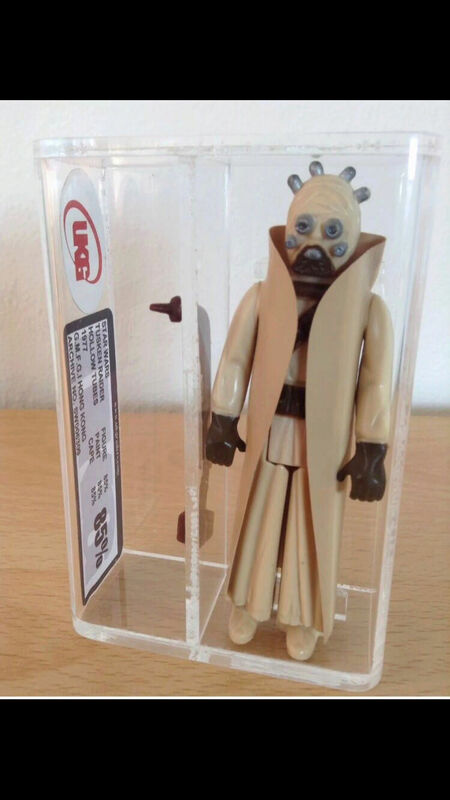 He would most likely have been a customised solid checks tusken also. 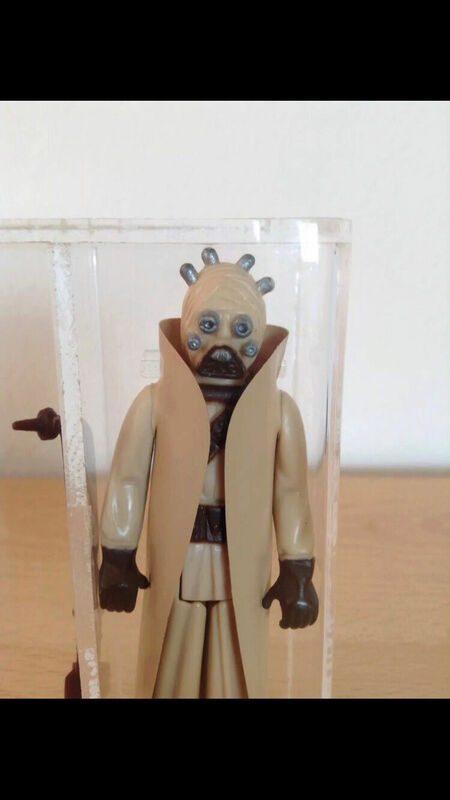 Since there is no proof of existence of a hollow cheeks tusken raider with acute angle upper sprongs, destroying it was a correct option as fake or customised figures should not be passed on for sale to future buyers. 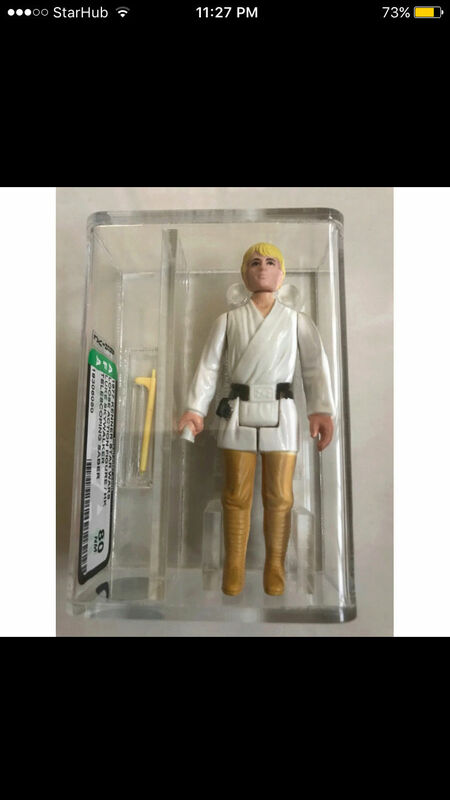 The dt luke with holes in his legs has also been destroyed.. figure was cut up and thrown away. 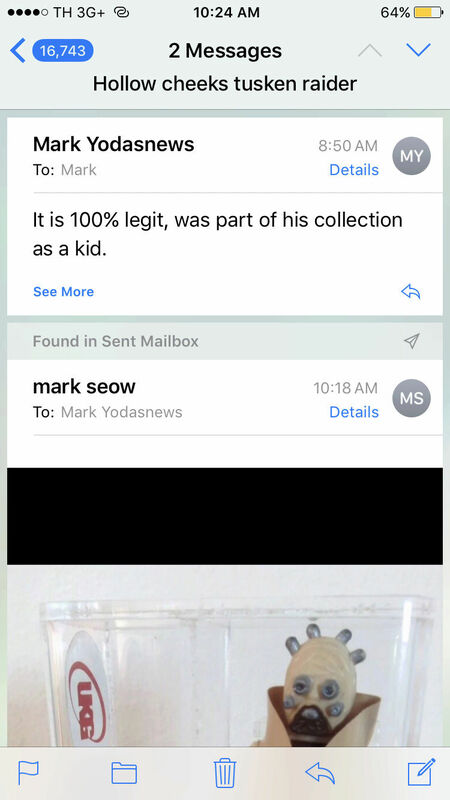 Just to understand, you purchased these items and then destroyed them without resubmitting them to either afa or ukg for closer inspection to determine if they were fake? The Luke had quite a few red flags but who knows with afa. They may have actually graded that in that fashion. 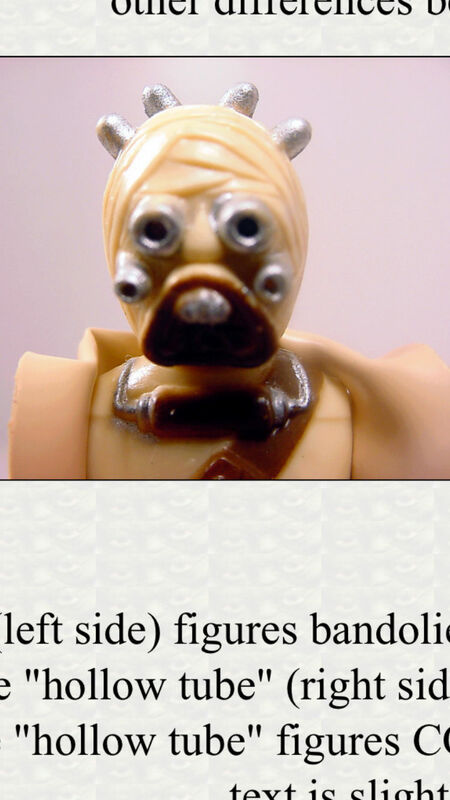 I am not familiar enough with the hollow cheek sand person to know 100% but a quick Google search of hollow cheek tusken raider revealed many many pictures and some look like this one minus the eye damage. Also there are possibly multiple coo marks for this variant. I don't know that there is anything to indicate this was fake with 100% certainty. 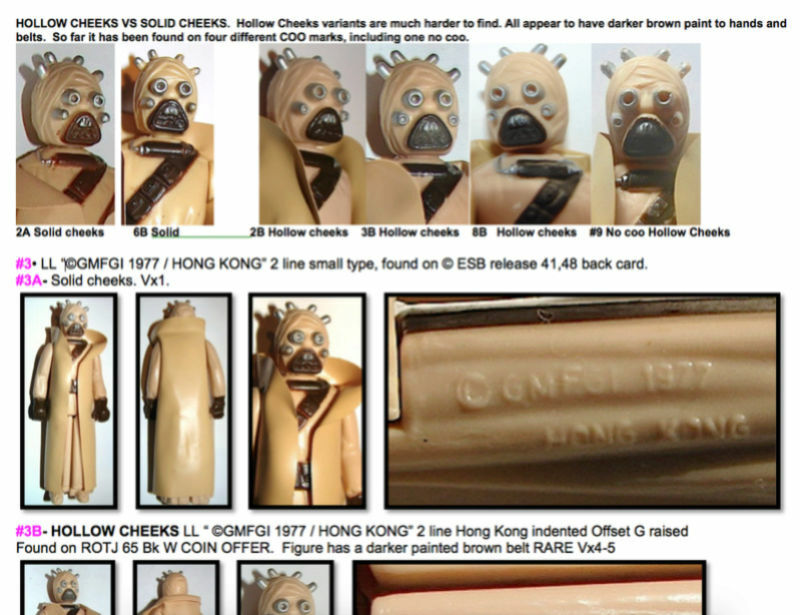 I have only found one similar looking hollow cheek tusken on the web, from yodanews.com. Please share with me which other website have similar looking acute angled top sprongs, or at least Attach some pictures? I can't seem to find any? Yes I destroyed it as I was positively certain that it did not match any other hollow cheeks on the web, although I found an image of a test shot hollow cheek with the same acute angled sprong, although it was thinner sprongs. Perhaps the acute angled sprongs version was an earlier version? 4th hollow cheek pic looks like closer angles. 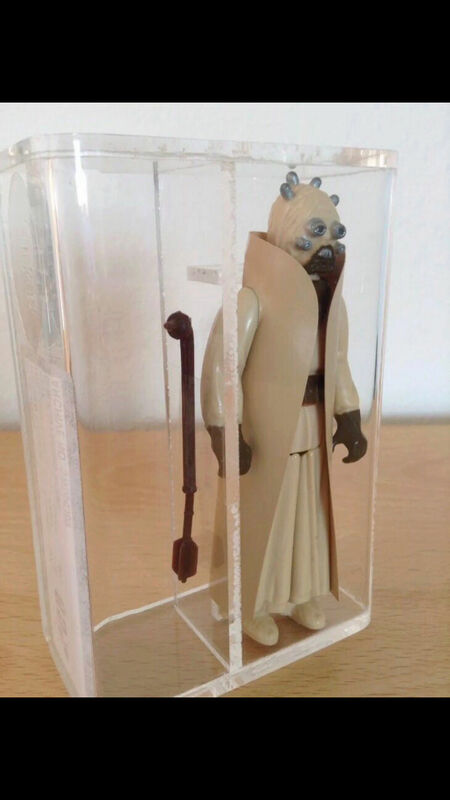 I think this may have been a legit figure and likely a legit grade. If it wasn't before destruction maybe other pics would ve good also. I mean we never saw the coo marking due to the case. Documenting fakes and comparison to real is the only way to tell these things. Destruction of the item eliminates that ability. Another indicator of the hollow cheek is the extra plastic on the sides of the sprongs. Picture 4 seems to have it, but mine doesn't. 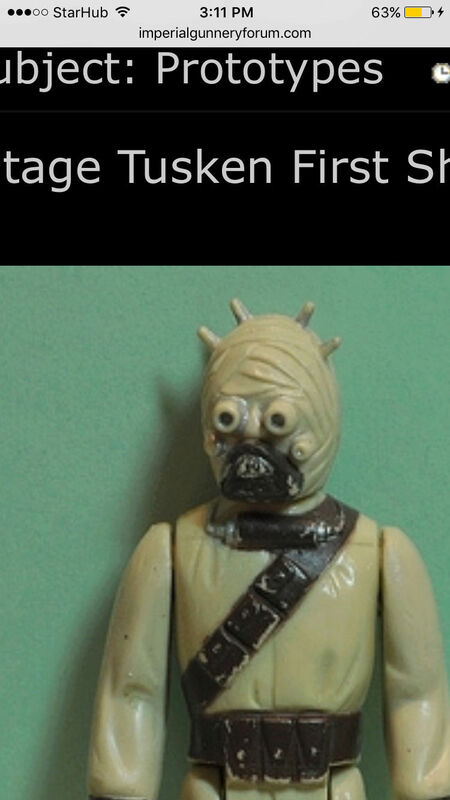 The owner of yodanews.com has emailed me to confirm that his hollow cheek tusken with acute angled sprongs was from his childhood and is 100 percent legit. Looks like I destroyed a totally legit figure. Lesson learnt- there might more variants then we think, and not everything not catalogued is a fake or custom. I destroyed it after I got the final confirmation from Aussie James who believes without doubt that it was a customisation. Yeah. I should not have destroyed it so easily. I have learnt my lesson. The dt luke was destroyed also. That there was reasonable justification because we do not want these items leaving into our community in the future. I got another dt like graded afa80. Looks much better than the 85 I destroyed. With an FF on the hilt. 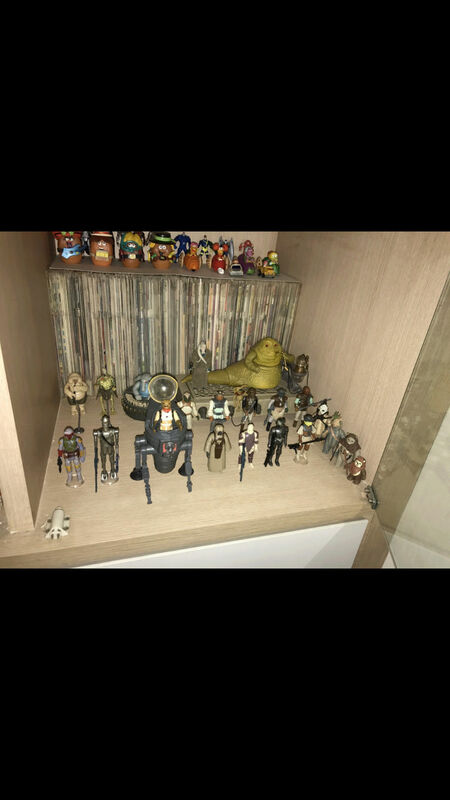 In my 7 months of Star Wars collecting, I have destroyed a painted yodas cane, a painted tusken raiders staff, a fake Jawa's gun, two black princess Leah's blasters, one blue sabre with a doughnut hilt, one yellow sabre with a doughnut hilt, one repro rancor keepers staff which failed the drop test, one fake stormtrooper, one painted romba staff, one grey warok bow, one painted teebo staff, one zuckuss gun that failed the drop test, one afa85 dt luke with holes in his knees, one tusken raider (which could be legit). All these weapons were sold to me with their figures from 6 different sellers claiming the weapons to be real. All these did not clear me. I punished the weapons by destroying them. 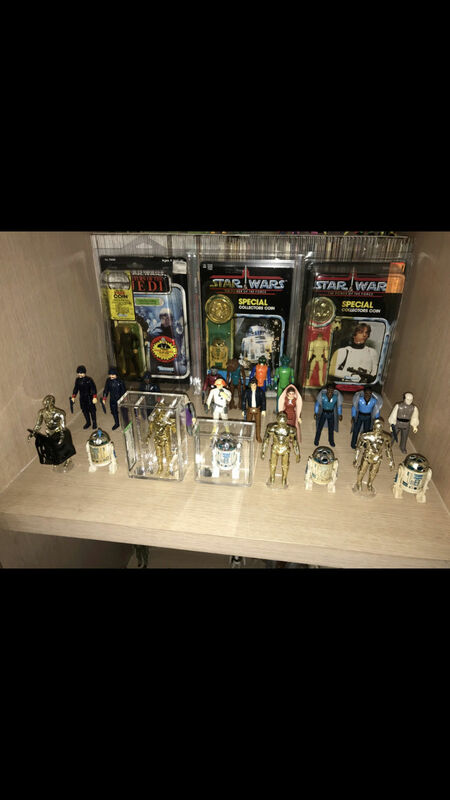 In my 7 months of collecting, I have met unscrupulous collectors who tell me that donut shape hilt Sabres were legit, I have met a despicable seller who said awing also came with a blue Ensor blaster, I have met sellers trying to sell me luke stormtrooper with a blue imperial blaster, I have also gotten a afa loose blue sabre luke jedi with a fake blue sabre inside. I had to order a legit blue sabre, a legit sample on eBay. 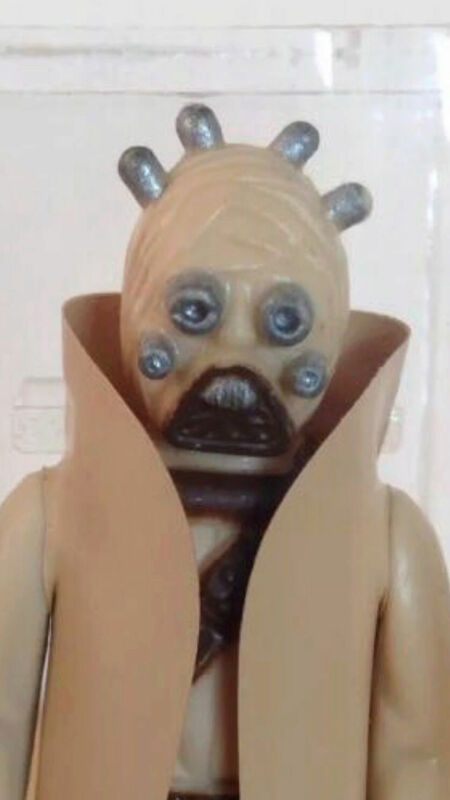 I had a seller trying to sell me a carded trilogo boba fett that was clearly a Toni card, I had a seller who sold me a Jabba playset with the pipe missing the handle. I had to go back to his house to demand the pipe. 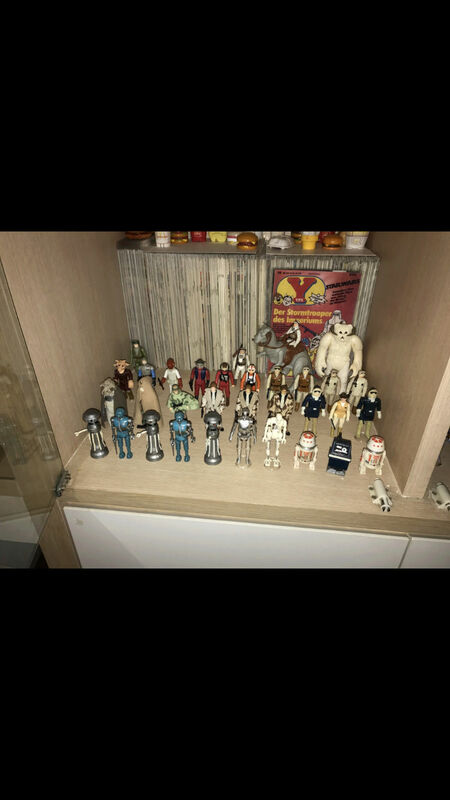 This is just 7 months of collecting! Was just trying to collect a loose sample of each figure. For obvious reasons I had no way of getting hold of a jet black gun for a luke stormtrooper as even the afa graded loose sample I got came with a wrong coloured blaster! In the end I had to get a carded sample. I got a carded r2 popup as there was simply no way to tell repro from original. In these 7 months I have learnt so much thanks to repros flooding the market, and crooked sellers all local in my country. I give them the benefit of the doubt that they are not aware. All I wanted was a loose figure set as I had Budget constraints, what I learnt is that take nothing for granted. Afa can be wrong, can be faked, serial numbers can be copied and made into fake stickers( surely it's easier to copy a serial number and a sticker than a whole figure?) even cards can be faked. all I wanted was a loose set as I didn't have a Budget and space to have a carddd set, what I took home was a good knowledge of repro weapons, as well as the ugly nature of collectors. This is my collection after 7 months, all bought locally after weeding out and destroying all the repro weapons. 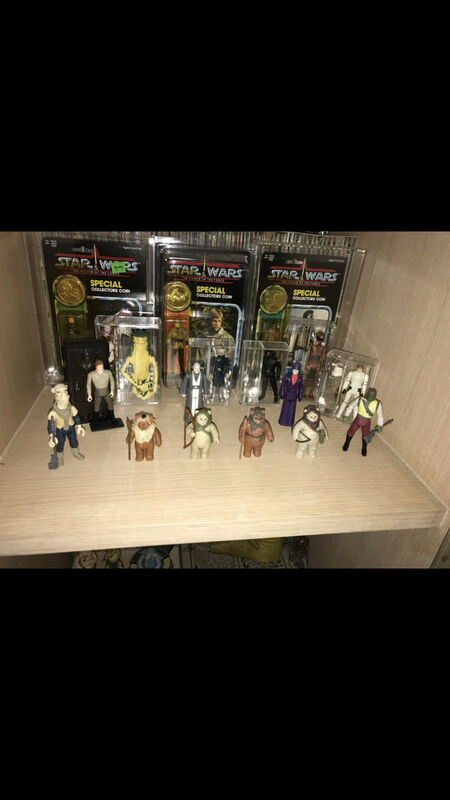 I have the basic set of figures minus the variants, but all with original documented weapons. The drop test is one of the most reliable methods when it comes to Star Wars weapons. Unlike G1 transformers, where even real weapons can have the "clang" sound, all original Star Wars weapons have the "clag" sound when dropped. Repro weapons which are unpainted mostly have the "clang" sound. There are no original star wars weapons with the "clang" sound when dropped. 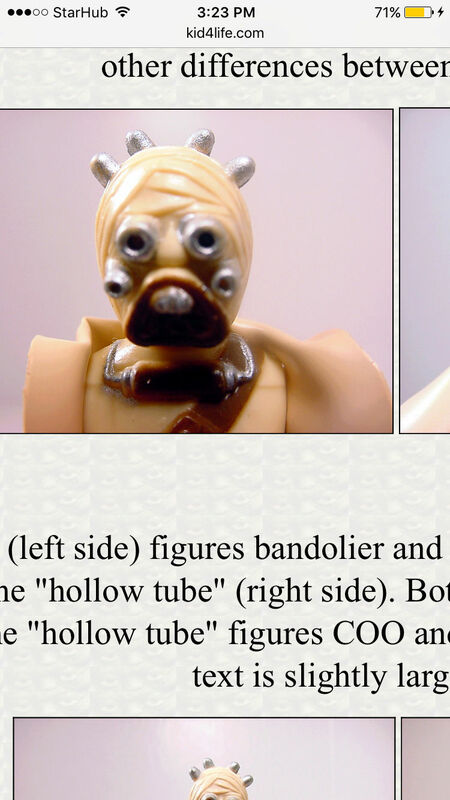 This test alerted me to the repro rancor staff which is also grey, confirmed by the sharp onion shaped point being thinner than the original, and also the zuckuss rifle, where the criss cross pattern ends at a horizontal line, I contributed this part on zuckuss to IG as there was no documentation on it yet. Hope it alerts more people to check their zuckuss rifles. 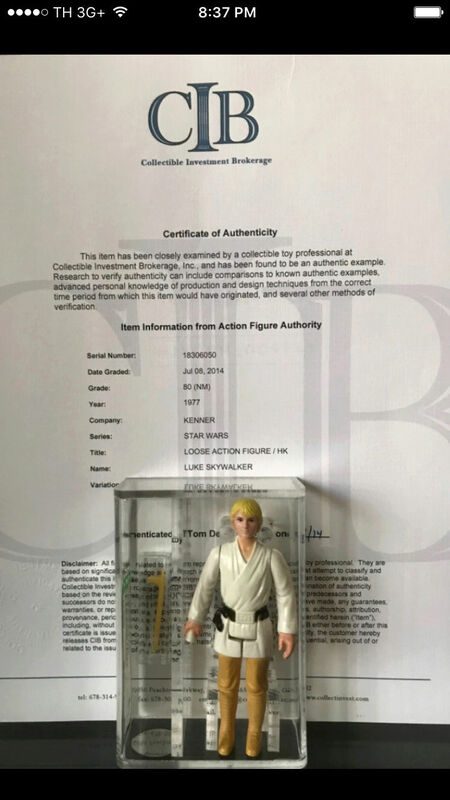 Sadly, not every seller will come forward and see they are selling repro figures. Out of 5, maybe 3 will admit, and 2 will pass them along, feigning ignorance. That is why we have to destroy repros as soon as we see them. We can't alow them to escape into the market... or people will be scammed. dt had to be destroyed, as even though we know how unreliable afa was...I mean that could grade repro weapons and stuff.. but will NOt be believable that afa will grade something with Two gaping holes an 85. No way. Ava's email reply was damage after grading in the case. That Too is impossible as the case is prestine. Afa will Not admit to the cases being possibly faked as this will spoil their legitimacy. Expensive items like this should be destroyed so that the seller knows he will not get away easy. And will not attempt to do this again! I'm sorry but I just don't follow your logic. You bought the items off of the seller and destroyed them. 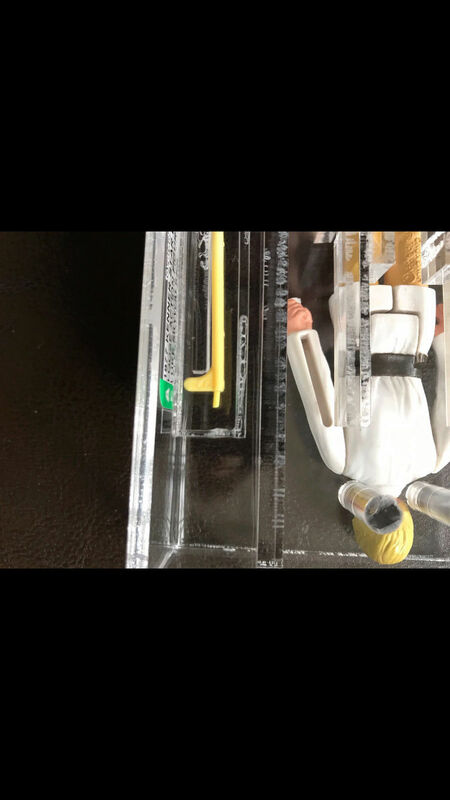 Scenario 1: let's say you're right and the DT Luke was a fake in a fake AFA graded case. You paid for it, the seller got his money. You're the only one who lost out. The seller was laughing all the way to the bank. He doesn't care what you did with it. He hasn't learnt his lesson. Scenario 2: the DT Luke was genuine (it should never have got graded 85 but we all know AFA make mistakes, there's loads of threads about it on the forums). You paid for it, the seller got his money. You lost out but more importantly the rest of the Star Wars community lost out. Everytime you destroy a figure without 100% proof that it is fake, no matter whether you were doing it for what you thought were the right reasons, the rest of the SW community loses out. 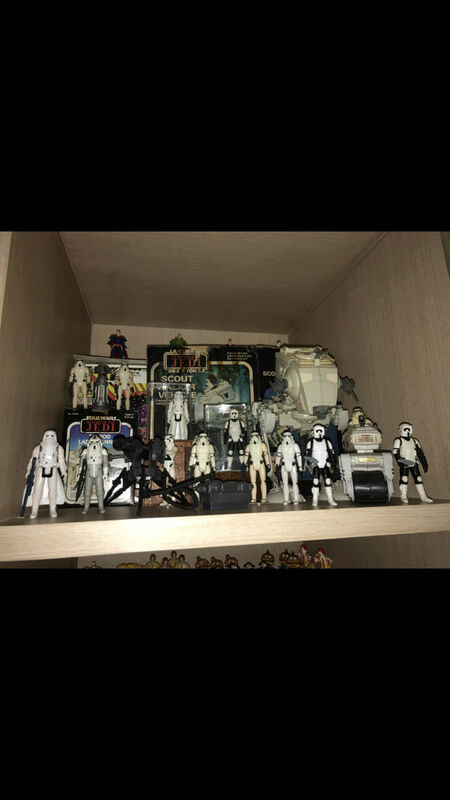 The figures you are destroying and the accompanying weapons are extremely rare items - they provide the individual with a lot of pleasure and enjoyment, but more importantly preserve the history and heritage of perhaps the most wonderful and treasured toy lines of all time. In the right hands they are shared and documented and provide us with a wealth of knowledge. You also destroyed a hollow cheeked Tusken Raider because you had not seen one documented with acute angled hollow sprongs. Turns out if was 100% authentic. 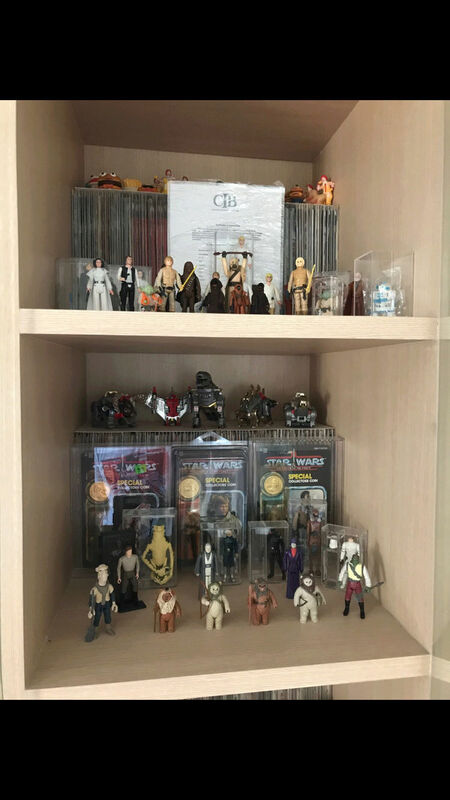 There are plenty of SW items in the community where there is only one known documented item in existence. The owners aren't falling over themselves to destroy them because there's little or no proof it was genuine. I know you're doing it for all the right reasons but there's a wrong way and a right way to go about it. Act a little less rashly, seek the advice of the experts, and please get confirmation first. Because once they're confined to the scrap heap there's no going back and we all lose out. 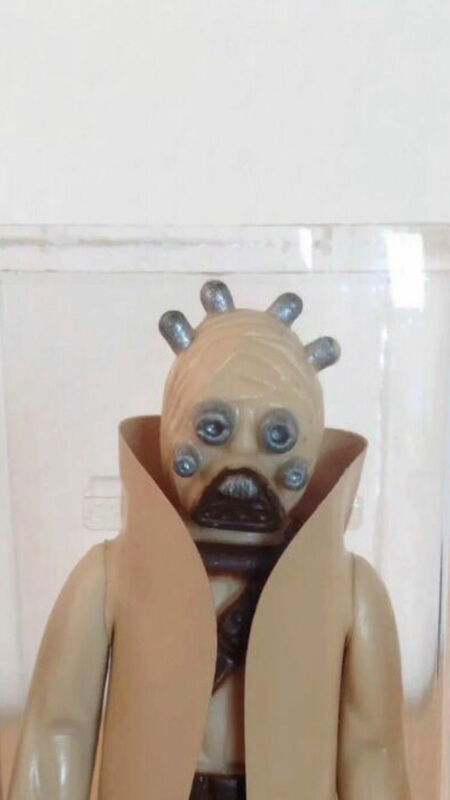 I did check with aussiejames if he was 100percent sure that the hollow cheek tusken raider was a custom, he said "yes". Only after his confirmation, I destroyed it. I have full trust in his expertise. 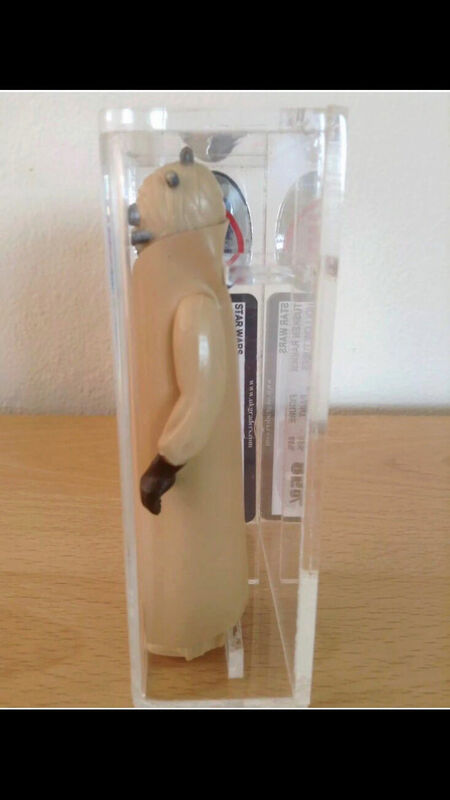 I did request other opinions on the item in question, I trust Wolff and " It's clearly touched up and it's clearly the wrong head mold so it's pretty obvious that the holes and the case must be fake as well. Drills some holes into the tubes and then smoothed it out probably with heat. I saw those years ago on eBay. They did come in a wave. Then disappeared...."
I still believe the case is real. I really think UKG could /should have been contacted. Steve at UKG was fantastic with help in giving his opinions on the princess Leia blasters etc. IF the case was fake I am sure he would have been very interested & concerned. I also appreciate "I have full trust in his expertise." please bear in mind I am an individual- it is my opinion- ALWAYS take time, do not jump to conclusions and get many opinions and work out a solution from there. Thanks aussiejames for clarification and for the wise words. I am in total agreement that we would be much the wiser if UKG and other experts had been involved. I still wish that they hadn't been so easily destroyed, but am glad there was at least some weight of opinion before destruction. 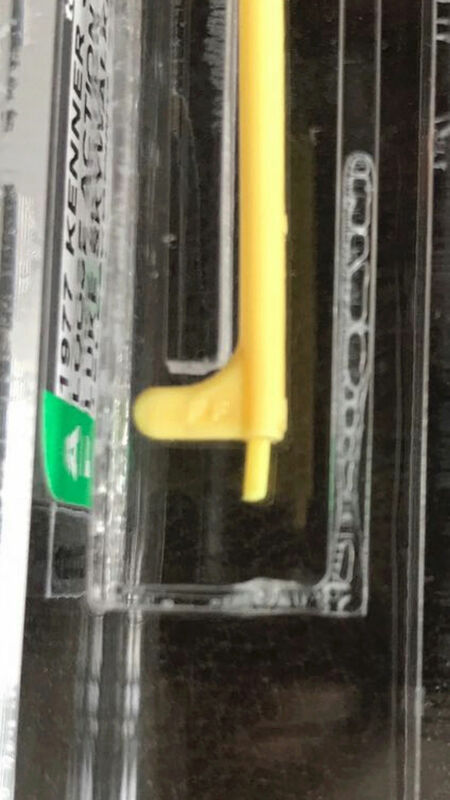 All in all I think I'm 99percent sure the hollow cheeks is a fake.. the only 1 percent I think I'm unsure of is this picture of the first shot prototype , which shows the hollow cheeks with an acute angle upper sprongs.